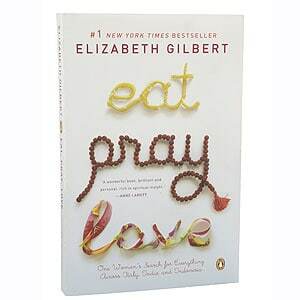 I read the book, Eat Pray Love by Liz Gilbert about 2 years ago and the story has stayed with me as one of my all-time favourite novels. I immersed myself into her journey of self-discovery as she travels to the three exotic locations (Italy, Bali and India) that I doubt I will ever get to visit. Her story inspired me to step out of my comfort zone and take risks. It’s a true story and is beautiful! I completely recommend you read it if you haven’t already. Now it’s been into a movie by Sony Pictures Entertainment! It was out in August and was at my local theatre for over a month because it was so popular. I didn’t get to see it, but will definitely watch it when it comes out on DVD. I can’t wait to see if it lives up to the book. World Market has joined forces with Sony Pictures Entertainment to bring you a line of products based on the Eat Pray Love theme. These products include leather journals, prayer beads, clothing and accessories and even wines from Italy! I received a beautiful Eat Pray Love Journal with a Bookmark and Pen for review. I think it would part of her Liz’s India travels with its rich design. Plus, the paper is handmade in India! It comes in four different designs. The one I received was a pretty turquoise. Even the pen is decked out in jewels and is very ornate. I love it for jotting down notes in. I am always writing stuff down in my journals and I would have to say that this one is the nicest one I own. It would also make an excellent gift for a friend or loved one. 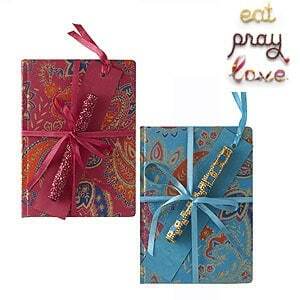 Buy the Eat Pray Love Journal for $9.99 at your local World Market store and check out the other Eat Pray Love themed products from the movie. I need to read this, read so many good things about it! read the book..saw the movie and loved both! I THINK I love the idea of a journal and other themed items! She didn’t read “Eat Pray Love” until she was essentially through the worst of her midlife crisis, which I think is for the best. Now she wants to go to Italy… I’m not complaining!